It’s the most wonderful time of the year! No matter what holiday you may celebrate, winter is time for family and time off from school — and no cheer practice! While you may be enjoying your extra hours of sleep and extra helpings of dessert, you might be a little worried about your cheerleading team. After all, what is everyone doing to stay in top shape during the break? While you aren’t required to do anything during your time off (it is a break, isn’t it? ), the urge to do something may strike. If that feeling hits, here are our favorite suggestions. Taking some time off and jumping right back into stunting can lead to sore muscles and falling libs. Feel free to do some of these exercises at home to stay in top stunting shape. Strong shoulders are essential for both bases and flyers. Bases need powerful shoulders to keep their flyers in the air while flyers need to be able to confidently push off their bases. Do some handstand blocks at home if you are able, or handstand shrugs if you are still gaining confidence in your blocks. Do a handstand against the wall and shrug your shoulders 20 times for a challenging but quick exercise. If the jump squats we mentioned weren’t enough, do these easy at-home exercises for toe touches that soar above even the best jumpers when you get back from break. Sit in a straddle and lift one of your legs a few inches off the ground. Begin rotating this leg towards the back of the room in small circles and continue for 45 seconds. Do the same on the other side, then do both simultaneously. Leg lifts strengthen your hip flexors and make toe touches and other jumps much easier. Keep your arm muscles engaged and your core tight by doing straight jumps at home. You won’t accidentally kick anything and get injured, but you’ll still develop your muscle explosiveness and power. Just make sure to do these with proper technique! They may be easy, but they won’t help if you don’t do them correctly. 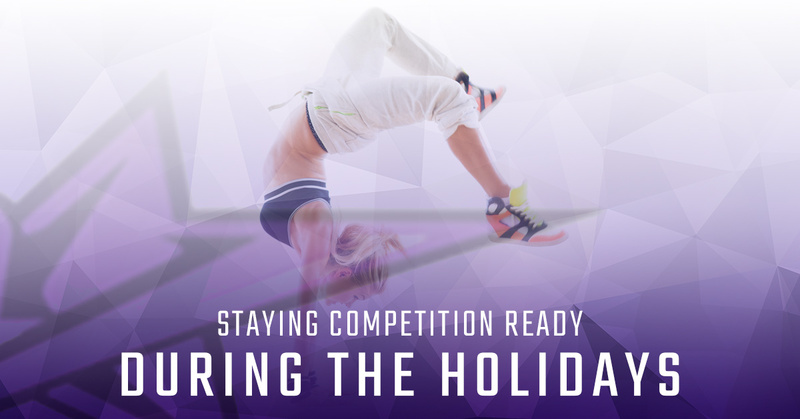 We may be in the heart of the all star cheerleading competition season, but the holidays are just beginning. Enjoy your time at home and ensure your body remains ready to go by the time you get back to MGA Cheer Extreme by doing your favorite exercises at home. If we didn’t list your favorite conditioning exercise, that’s okay — your coach likely has some suggestions for you. Just ask us before our next break starts. We can’t wait to see you and your team back in practice and tumbling classes!